the weather predictions, that might be unlikely this year. How I look forward to the sunny days ahead, walking the trails, checking vacuum in the lines, and touring groups through our woods. We have some of our best times connecting with friends old and new during the late nights in the ol’ sugar shack, boiling, firing, waiting, bottling and cleaning, oh the cleaning!… The good ol’ days indeed! Like most other producers we would love a new sugar house; ours was built by my great grandfather,my grandfather, my dad and uncle. Many upgrades have been done over the years including our new lead free evaporator, the installation of food grade components and some comfort features including a heating unit, but as we curse the crooked floor and make repairs to the structure we can’t help but smile knowing that we’re continuing not only a truly Canadian, but also a truly Greenlaw tradition. 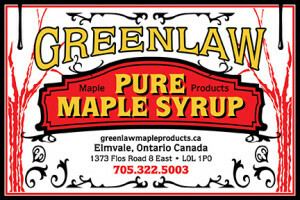 Please visit our sugar house this spring. 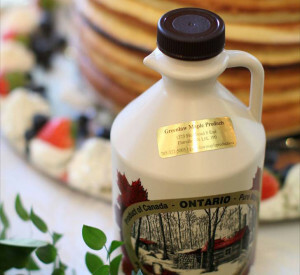 We will do our best to explain our craft, welcome you to walk our trails and gladly offer you samples of our maple syrup.